Are your children bored this summer, or totally engrossed in their iPads, iPhones, or other digital device? Then show them some old-fashioned fun. 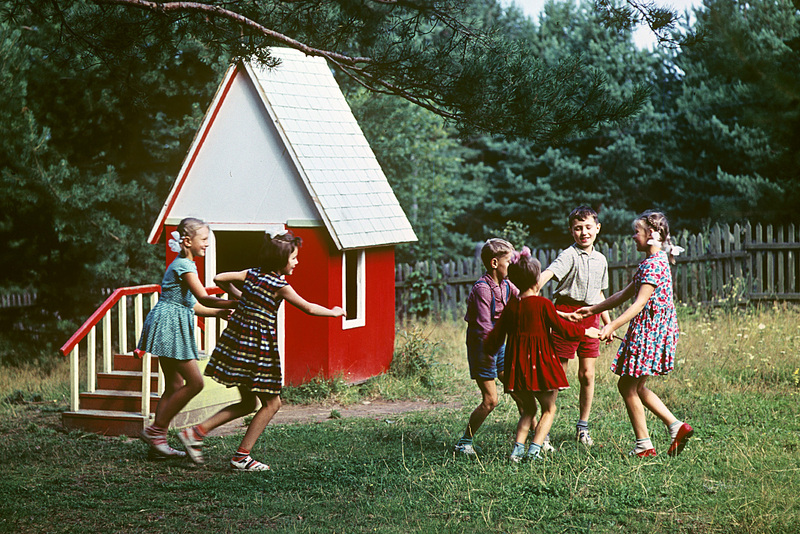 Here are some ideas that have long given joy and amusement to several generations of Russian children. Draw two lines that are roughly three to six meters apart. One kid is a traffic signal, or the leader, and he stays between the two lines. Behind his back, and behind one of the lines, are the other kids. The leader calls out a color (best to choose something unusual; not just red, yellow and green), and then the kids must look for this color on their clothes. If they find it, then they show it and run across "the road" to the other line. The leader tries to catch them and the child who is caught takes his place. Children stand in a circle and throw a ball to each other. Don’t hold it too long because it's a hot potato! If you hold or drop it, then take a seat inside the circle and become the potato. Now, the task is to catch the ball without standing up. If he catches it, then he goes back into the circle, and the kid from whom he caught it takes a seat in the center. Each player bounces a ball and on every bounce he calls out something from a thematic list; for example, “I know five girls names,” “I know five boys names,” “I know five rivers,” and so on. After calling out this five, he gives the ball to another player to do the same. The one who loses the ball, or who thinks too long must also pass the ball and then repeat his topic. This is a modified version of hide-and-seek. Before starting, players choose a leader and build a type of ‘base’ by placing a board on a stone or a brick. One side of the board is on the ground and the other faces up. Players put 12 small sticks (or pencils) on the lower side, and use the board as a lever to send the sticks flying. When the leader gathers the sticks and puts them again on the board, the players hide. The leader searches for the players and guards the base. Those who hide try to touch the base when the leader isn’t watching, and scream "knock-knock [and name]," and then try to ruin the base so that the leader has to put it back together again. This is a very old game dating to at least the early 19th century, and is primarily a girly game. It has changed a lot since then, but the main attribute, a ring, remains. But you can use any other small item, such as a coin or a button. Players sit in a row, hands folded together. The leader puts his hands the same way, but with a ring inside and then approaches the players one by one, putting his hands inside the player's, and tries to also put the ring inside so no one notices it. The others look carefully and try to guess where the ring is. When the leader finishes the row, he says, "Ring-ring, come out to the porch," and the player with a ring runs out and the other players have to stop him. If he gets away, then he's the new leader. This is one of the most popular games and is even played in school gym classes. Two kids stand on opposite sides of the playground and throw a ball to hit the others. Players move about freely, and those who are hit must get off the playground. The last player standing tries to avoid the ball as many times as he is old, plus one. If he doesn't, then he switches places with whoever hit him. Another rule says each player who is hit immediately changes places with whoever hit him. If the one in the middle catches a ball, then he gets a bonus and doesn't get out the next time he’s hit. This old and popular game is like team hide-and-seek. Players split into two teams, with one hiding (Bandits), while the other searches and attacks (Cossacks). Bandits have a secret password and draw arrows on the ground showing the direction they’re running to. Their goal is to confuse the Cossacks. While the Bandits are hiding (10-15 minutes), the other team finds a place to ‘torture’ their opponents so that they reveal the password (usually tickling is the torture). If the Cossacks learn the password - they win. Prepared by Maria Gavrilova. This is an abridged version of the original published in Russian by Arzamas.